Once you have your first cut of your site which you have tried to build in accordance with the previous sets of rules, or if you have redesigned your site to optimise it, then try these tools to check your site. The Google browser size tool at http://browsersize.googlelabs.com/ is useful for seeing what the percentage of people can see what on your site without having to scroll - but being phased out for Google analytics new tool. Click on images below to enhance view. Soon to be redundant Google browser size. Note how the single advertisement in this site was placed in area where only the top bit was "above the fold". The Google tool also gives percentages of where clicks are occuring most and in this example also states that there are 11% of clicks taking place below the fold. It shows how the majority of people stick to the landing area. Use tools such as http://wave.webaim.org and type your site into this. Using major frameworks such as Blogger and Wordpress should deal with many of issues as they have considered much of this in design of frameworks. Whenever you design or redesign test your site and use these tools to ensure high grade landing area. The focus of this post is on the landing area (see previous post) and what will be visible to the largest majority of people on first hitting your site. Use dynamic templates and web design using relative pixel width and heights - If you can't it's not an issue but fix your resolution at 1024*768 or less. More importantly design your landing area to be 960 pixels wide by 700 high maximum. Place all key information and leads in this area and in order of importance from left to right. Use Blogger and its mobile facility to avoid worrying about smart phone growth creep and need to design device reactive sites. Screen resolution and size help tools. You have attracted people to your site so you don't want to turn them off do you ? How you design your site layout, its flow, and the size and type of screen view are complex issues and will be one of the main factors in attracting people to visit your your site, and more to the point staying on it (and if advertising, how much revenue you make). The most important aspect by far of course to the visitor is relevant content. It is the information they have come to see and read, not how you display it. But if it is unreadable and you have no idea on where to go next on your site, if key information is hidden in obscure places, then the reader will go elsewhere. What we are trying to achieve in this post is to determine what is the optimal size and layout that you should be designing your site to, to ensure that the most important features of your site are seen when the viewer first hits your site. When the viewer first hits your site they hit what is often referred to as the landing page. This doesn't necessarily have to be the main site page and is often a separate page used primarily to entice people and is search engine optimised. As a landing page could actually include everything on a large web page that isn't immediately visible, then in the context of this post we need to be more specific and target what I will refer to has landing area. This is what you see when you first hit a site. It does not include any sections of your landing page that you need for example to scroll down or scroll right. Of course your monitor, resolution, or page design may mean that everything is visible straight away but usually there are at least some areas where typically you will have to scroll down. The landing area is the part of your site which will entice the viewer and make them fully engage. Content or ads below or to the right of this landing area will not be immediately visible to the viewer and if the most important selling feature of your site such as "Get free cash" isn't there, then people may just jump onto the next site. An "Add to cart" placed to the far right may similarly be missed completely because of screen design issues. Another common term for this is "above the fold" and Google for example states "What is actually “above the fold” on a web page is a significant factor to conversion rates. If visitors have to scroll to see an “add to cart” button, or some other critical element, they may never get around to it. " Above the fold comes from newspapers who similarly focused on the upper half of the front page of a newspaper as the headline grabber to attract buyers and readers. But given the dynamic nature of the web , the ability to scroll up or down. left or right , then this term maybe past its sell by date. As above this is large area so this subject will be broken into a series of articles and sections as below. You view web sites normally via a web browser on a screen of varying size set at differing resolutions. 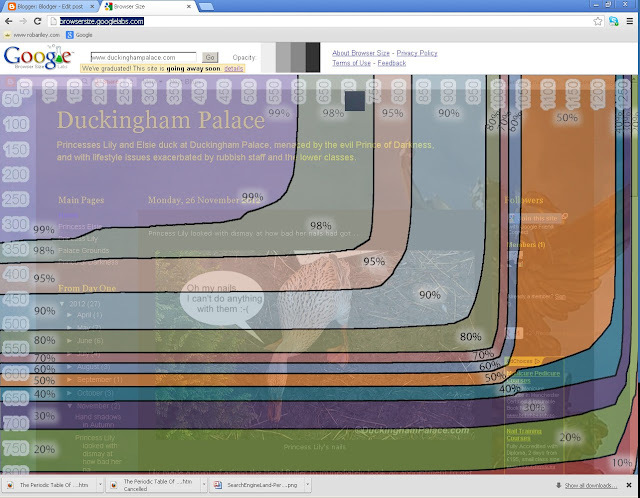 PC/MAC users will generally view web sites via Internet Explorer, Chrome , Firefox or Safari on multiple sized computer monitors of which the average is now between 19" and 21" (this is the physical size of the screen on a diagonal from top to bottom corner). Laptop/Note book users will do the same but with smaller monitor size . 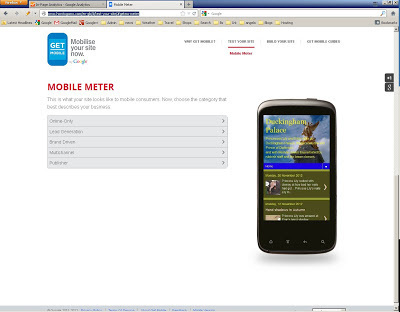 Tablet and Mobile users use many other browsers types but on much smaller screens from 2" to 10". Obviously with larger display devices then there will be an opportunity to make more apps and browsers windows viewable at the same time in the main screen window. With smart phone and tablets you acknowledge this price you have to pay in terms of screen content because you can carry your device almost anywhere. From an overall design and screen size perspective the type of browser is largely irrelevant. What is more important is the amount of space used on the screen by the browser clutter and what is left that is available to your website. This eats away at your valuable landing area space and there is little you can do about this except acknowledge that all readers will have this clutter, and that you need to take it into account. If you take into account the browser header, the menu, tab, address/navigation and the bookmarks or favourites bar, then you may be taking away upto 10% of your visible screen resolution height. If the viewer has bookmarks or history sidebar open on the left this will similarly encroach into the visible space on average about 10-15% of screen. Most people do not optimise height. Smart phones and tablets fortunately tend to rely on the hardware of for some key navigation features rather than use up the critical screen space which they have so little of but still the clutter takes up space.There is a distinction that smart phones and tablets will also use "Apps" rather than web sites, and these Apps will be optimised for the device. It is also possible to design web sites which will determine the device, and organise layout to match. Blogger authors will obviously have noted the Mobile feature which rearranges the blog to be viewed in a device optimised manner. In Blogger it primarily displays just the header and posts. The display resolution of a display device is the number of distinct pixels in each dimension that is displayed. For example 800 * 600 resolution means 800 pixels wide and 600 pixels high. Pixels are what the visual image on screen is made up of and what your blog will be displayed to. If you design your web site to be 800 * 600 and display it on a screen with resolution of 800 * 600 then it fill fill this screen. If you use the same design on a larger resolution of 1200 * 800 then there will be blank elements surrounding your site. If you use the Blogger Next blog feature on the top Blogger bar, then you may find it interesting to see how many sites do have space down both left and right sides. Then reason for this is that the majority of people have large screen resolutions but many of the default Blogger templates are smaller. If you designed your site to be 1078 * 960 and the viewer was looking at the site via a screen with a resolution of 800*600 then they would not see the full opening content in this screen and would have to use the side and up down scroll bars to see the rest of the main landing content. The average resolution has increased in size over the years from 800 * 600 prior to 2003, and until very recently 1024 * 768, but it is now 1366 * 768 for majority mainstream monitors. It is safe to say that over 95 % of PC/MAC monitor users have resolutions set at 1024 * 768 and above. But in saying this the use in the number of mobile devices is increasing rapidly. Current estimates in late 2012 suggest that the mobile market is providing 20% of web use access. It is expected to continue to grow. Some people have never used PC monitors. To make it more confusing your monitor can generally be set at different resolutions to suit your preferences (and eyesight). Although most tablets are hard set the resolutions can be high (HP Touchpad defaults to 1024 * 768, iPAD 3 can be 2048 * 1536). And also for both browsers and smaller devices there are other controls which increase resolution in windows. Smart phones allow you to increase resolution by "expanding your fingers" on the screen. Browsers can use commands to such as control + to makes changes to resolution internal to browser. And then even more there are aspect ratios (the proportional relationship between its width and its height) such as 16 wide to 9 high to consider, and then that with tablets and smart phones the orientation of the screen can automatically change from portrait to landscape by moving the device in a certain way. Its is interesting to also note the change over the years from square screens 4:3 aspect ratio to widescreen displays, which generally have the 16:9 aspect ratio. And finally if you are clever enough and/or use the right technology and templates you can have sites which dynamically expand and contract depending on change in size of browser window. 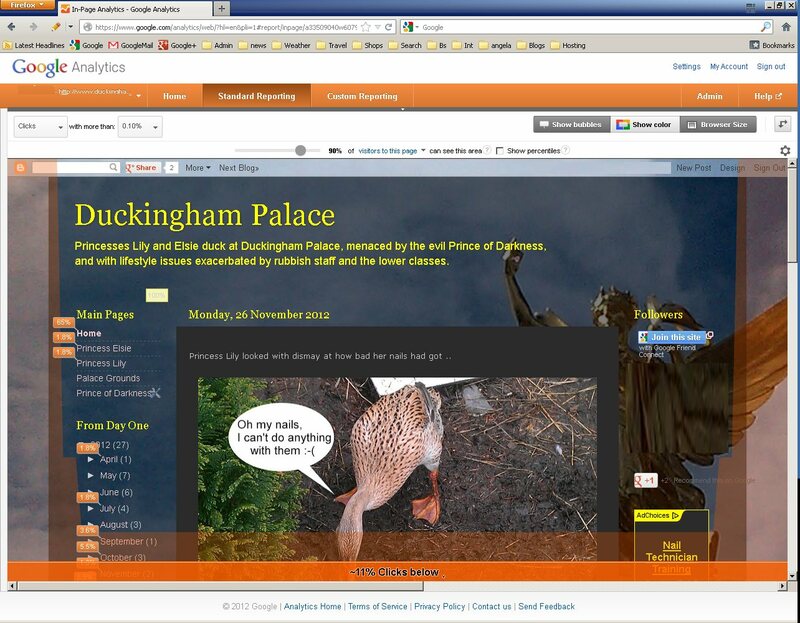 Note that Blogger has several dynamic templates which you can use. Basic HTML allows use of relative size rather than fixed widths and heights . So all very confusing but do not despair! The next two posts recommend the best resolution to use and then also some tools which help you optimise your site. It's great to see other people commenting on your Blog, it shows interest, it adds to your knowledge, it adds to others knowledge and interest in your blog, and you may get a kick out of helping others. But on the other side you get to waste time answering questions from people who may never understand, psycho trolls, etc. On start ups when you will not get a great deal of readership, it may negatively influence the view of your blog if there are series of 0 comments throughout.. But on the other hand you may get a negative impression by not having them. Click on the Edit link any individual post . What if you wanted to display or embed another site or forum within your blog? For example your blog may want to direct your reader to see what another site looks like but without taking them away from you blog. Links via blog rolls or linked list generally open up in either a new page, tab, or window. The fact that people are put onto on another site means they may not come back. What if there is another web site tool which is based on another site which you can link to and therefore embed in your site. You may want to include a member forum within your blogs (although the way blogs are structured and the whole point of them doesn't necessarily lean towards having forums within them and expect to use the forums owned credentials for security and membership). Another potential solution is to use Nabble which claims to provide an embeddable forum within many frameworks such as Blogger. Where it says http://litemind.com enter the enter the site you require , http://www.bbc.co.uk/sport/ etc. 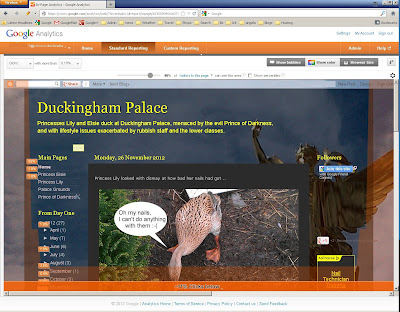 It also has another example page with a Duck web site in :-) plus a number of other example to Nabble, Amazon and Google maps. (see the post Embed Google maps for further on the later). Also note the blank iFrame that was intended to include Amazon.com..
For security reasons in the latest version of most modern browsers, http iframes no longer load in https pages by default. Blogger blogs are delivered using http and Google do not provide a https version. So this means that HTTPS sites will not appear in Blogger using a modern browser unless the browser user enables their browser to accept mixed content which is unlkiley to happen.The HTTPS issue is described in part in the following Google product forums here, and other similar issues here and here. The first article suggests a number of alternatives which don't unfortunately provide a good way forward for Blogger users yet. Oddly enough Blogger.com (when you log in) is HTTPS but your actual blog is HTTP. Gmail is HTTPS and most major sites are as well. Apparently performance reasons are at the root of this. And oddly enough embedding https Google maps and youtube videos work fine. Blogs are normally based on posts being seen latest first.This is the default action for Blogger (and why Blogger doesn't provide a widget or tool to do the opposite). The default method follows the true nature of blogging that your regular readers want to go into your blog today and see what you have written today. If you have 500 posts the last thing they want to do is delve into your archive to find your most recent post. Yet there are good reasons for have for example a selection or all of your posts in chronological order where your oldest post is displayed first and the latest at the end. You may for example want a tab or page which displays a series of posts which are in form of a course and you want people to see them in course (date) order. You may be giving a life story or history where it may be convenient or better for reader to see posts in chronological order. Use the Blogger Archive widget and check the oldest post first option. This has a number of advantages in that Blogger does most of the work for you, and provides a small number of styles and frequencies. You can show a list of your posts hierarchically or a flat style, and show posts daily, weekly or monthly. But a flat list can't show post titles, and the archive will show all posts. Change dates on your posts (and hide the date) .This is easily done in Post editor, Post settings, Set date and Time for each of your posts to put them in the order you want them to be in. Blogger will automatically then sort your posts in reverse order. You could artificially enter a date in the actual post content. Seems a real ache to me but will work for single subject blogs. Create a page with links to posts and these posts are entered in the chronological order you want them to be. At its simplest in the Page Editor you just insert a link using the link icon in the (chronological) order you want them to be in. So for each link you need the actual web address of the post you want plus you need to recall the date of the post. These can all be modified at any point.This is probably best done with two tabs open, one on the design page and one on the live view of blog (or use the two browsers method as here) or copying details to a separate notepad page. For the first link paste copied web address of post into Web address text field, then the title and or date of post in the Text to display text field and Ok it. Post links can then be inserted on the page in this way in the order you want them to be in.It would probably be good if these links where formatted in a prettier way so you could use the list options given in page editor or perhaps tables as per this link. Only trouble is that you have to manually create all the links but on the other hand you have total control. Remember you can have a static page on home page to hold these links. Used a link list widget. In layout editor add the link list widget where you want it. In the Widget again enter the web address of your post and the post title in the site address text field. Ensure "Do not sort" chosen. When you have entered all your links then you can use the up and down arrows to put them in the order you want. if you want to put dates in, then put these in the site address field. As above you have top manually create all links to posts. Choose your Youtube video . You should now see the classic you tube clip, the Battle of Kruger. Note you can also use the same method to embed within posts or pages. Rather than give several full content posts on your main page you may want to give just a summary of multiple posts, and then allow users to click on a Read me link to get to the main detail. The benefit of this is that you can show parts of multiple posts of your main page which give user a better flavour of your site, entice them to read on to other pages/posts, and also improve your style by hooking readers in the first few lines several times. There are number of ways of doing this.